Being a rookie on the Walmart FLW Tour made it easier for Johnson – not yet a household name among the bass fishing circuit outside of Michigan - to fly under the radar, steadily climbing the leader board each day and finally emerging on top after bringing his best bag of the tournament to the scales on the final day. Johnson's approach was a study in consistency and patience. Confident in the area he was fishing, he stuck with it all four days, knowing that even when the bite slowed, he would be able to quickly relocate fish and resume catching them. Consistent success at the highest level of competitive bass fishing – be it the Walmart FLW Tour or the Bassmasters Elite Series – has been a struggle for Michigan pros – those not named VanDam anyway. So how has a Michigan rookie achieved success so early in his career where others have failed? 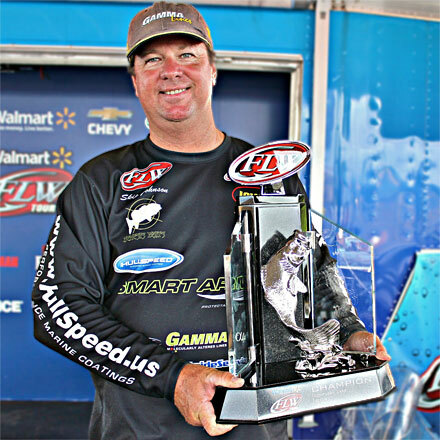 Johnson credits his early fishing experiences in San Diego, California - he moved to Michigan 10 years ago – as critical in the development of his bass fishing skills. Despite headline-grabbing stories of huge bass in southern California lakes, overall, tournament fishing there is tough. "There are days when you know you might only get three or four bites the entire day," said Johnson. When bites are this few and far between, anglers either learn to be extremely patient and thorough in selecting presentations that maximize their odds, or risk coming to the scales with an empty bag. Johnson believes Michigan's great bass fishing – particularly Lake St. Clair and Lake Erie - actually works against local anglers and leads to the development of bad habits. When 50 fish days are the rule, seldom do anglers need to spend time on a single spot to eke out one or two bites. It's much easier and efficient to simply pick up and move on to the next waypoint in search of active fish. While living in California, Johnson was also a part-time saltwater guide which is where he learned the finer points of interpreting electronics and relocating fish – skills that served him well on Kentucky Lake. His key tournament spot on Kentucky Lake was a series of a dozen or so rock piles along a creek channel edge that fish constantly moved between. At any given time, there were active fish on at least one of these rock piles and Johnson's expertise in interpreting his electronics enabled him to quickly find the ones with active fish on them. Despite being locked onto the fish throughout the tournament, the outcome was still in doubt on the final day, primarily because Johnson was losing a lot of good fish. After the third day – his lightest bag – it was clear he needed to make an adjustment that would improve his hook-up percentage. He switched from a jig and plastic to a worm to reduce the amount of plastic that could impede a solid hook set, changed to heavier line to reduce stretch, and finally, focused on making shorter casts. 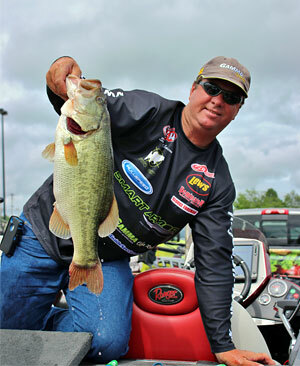 These changes dramatically improved the number of fish he boated and led to his biggest bag of the tournament – enough to catapult him into the winners circle. Johnson hopes momentum from this win carries over into next year when he plans to continue fishing on either the Walmart FLW Tour or the Bassmasters Elite Series. Whichever circuit he chooses, his unique and diverse background should lead to a long and successful career.